I'm an English major with an Art minor and trying to work my way into a job in video game story/script writing (Maybe some technical writing as well). As far as the art thing I like to do character sketches, and even enjoy drawing different clothing concept designs. Favourite style of art: Sketches, scanned and inked on photoshop with color and shading effects applied after. Favorite visual artist Daniel Dociu, Kekai Kotaki, and Kristen Perry. Favorite movies The Avatar Finale Favorite TV shows Scrubs, Young Justice, Avatar: TLA, Thundercats, X-Men, Naruto/Naruto Shippuden, The Melancholy of Haruhi Suzimiya, etc. Favorite bands / musical artists Yellowcard, All Time Low, Sherwood, Mike Tompkins, Michael Buble, Sarah Brightman, and Diana Krall. Favorite books The Inheritance Cycle, Harry Potter, Lord of the Rings, Chr. of Narnia, The Hobbit, The Redwall Series. Favorite writers Brian Jacques, he's why I love reading. Favorite games Guild Wars, Guild Wars 2, Mass Effects, Halos, Fables, it goes on and on and on. Favorite gaming platform Xbox 360, PC, DS Tools of the Trade Give me a pencil and watch it dance. Adobe Photoshop. Other Interests Gaming, Writing, Drawing, etc. It's been a whole year since I've made an entry! It's that snowy (or just cold if the snow storms are being shy) time of year again. Let's see. Since my last post I found more temporary work at the local library until I got a contract position out in Las Vegas as a QA Tester for 2K. That was kind of big deal for me since I'd been looking to get some industry experience after college. Sadly, my contract was ended in October during a big game release season so now I'm back on the hunt. Hopefully it won't be as hard to find the next job. Hope you're all having a fun holiday season. I've been busy following TV series like "Arrow", "Flash", "Agents of SHIELD", "The Legend of Korra", "Forever", and "Parks and Recreation". Meanwhile, I'm also waiting for the new seasons of "Downton Abbey" and "Game of Thrones" to start. 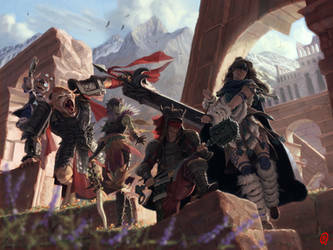 I've also been writing for "GuildMag", an online Guild Wars 2 fan magazine. Stay warm, and have a wonderful season. Thanks! I'm in process of moving back to Wisconsin so I haven't been on a computer since before my birthday. I'm back home since 2K terminated my contract at the beginning of its release period. It wasn't entirely unexpected. BRO, DO YOU EVEN FAV? oh wait... yeah you do.